The English Premier League Matchday 30 kicked off last Saturday with some tasty fixtures to look out for. The most notable of them being a clash between Unai Emery's Arsenal and Ole Gunnar Solksjaer's resurgent Manchester United side at the Emirates Stadium. The race for the top four is as spicy as ever with just 4 points separating the 3rd, 4th, 5th and 6th placed teams and the two-horse race for the title seems to be getting increasingly exciting with each passing week. As far as the bottom of the table is concerned, things do not look too bright for Fulham and Huddersfield following 0-2 and 3-1 losses to Bournemouth and Leicester City respectively. A brief peek into the results over the weekend as far the 'Big Six' are concerned would help one understand who stands where with respect to European qualifications, with 8 matches to go in the EPL. 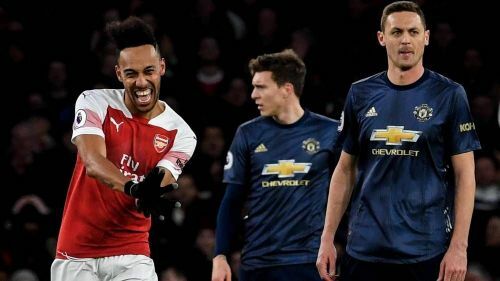 Manchester United went away to the Emirates after both the Red Devils and the Gunners were on the opposite side of a 3-1 scoreline against PSG and Rennes in the Champions League and the Europa League respectively. Arsenal went for a pretty attacking line-up with three players at the back and Ozil, Ramsey, Aubameyang and Lacazette all up front. Manchester United started with a 4-4-2 with Fred and Matic in the middle of the park. However, it didn't really work out as Matic didn't have one of his best performances possibly due to the fact that he has just returned from an injury. United had a decent first half but they just couldn't bury any of their chances. Lukaku was reminiscent of his 'Mourinho' days, maybe since he seemed to be playing a lot deeper than he is usually supposed to. Bernd Leno was phenomenal for Arsenal. He made some really great saves. On the other hand, David de Gea made quite a mess for Granit Xhaka's first goal. The final scoreline (2-0) does not reflect the true picture. United could have done better and Arsenal were a bit lucky. Chelsea took on wolves in another interesting encounter on Sunday morning. It went as expected. Wolves were happy to sit deep and counter and it did work for them as Raul Jimenez gave them the lead in the 56th minute. They were well poised to take all 3 points were it not for Eden Hazard's stoppage-time equalizer in the 92nd minute. The match ended in a 1-1 draw. Manchester City hosted Watford in a match that saw a lot of drama. There has been a lot of controversy around Jadon Sancho's transfer to City of late. If that wasn't enough, the opening goal offered even more talking points. Raheem Sterling could have been offside. Not that it would have made much of a difference to the final result. City ran away with the 3 points with a 3-1 win. Liverpool had an enjoyable time against Burnley. Burnley are tricky opponents and many of us thought of them as a potential banana skin for Liverpool. Nevertheless, that was not to be, as braces from both Roberto Firmino and Sadio Mane saw Liverpool finish the game pretty comfortably albeit they conceded two goals as well. Tottenham Hotspur are enduring an absolutely disastrous premier league form. They have been winless in their last 4 EPL fixtures, 3 of them being losses to Burnley, Chelsea and Southampton respectively. Despite enjoying much of the possession throughout the match against Southampton, the absolute banger of a free kick from James Ward-Prowse in the 81st minute pretty much sealed the win for the Saints. To round things up in the Premier League, City retain their 1 point league over Liverpool. Tottenham have just a 1 point lead over fourth-placed Arsenal. Manchester United and Chelsea stand at 5th and 6th respectively.